Honestly delicious. Naturally skinny. 1st prize for taste. 2 of your 5 a day per 300g. Made with Yorkshire Wensleydale Cheese, handcrafted in the heart of the Yorkshire Dales. Low in fat. No added sugar - contains naturally occurring sugars. I'm gluten free. Vegetarian. 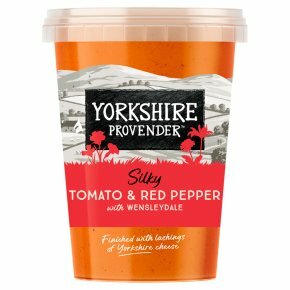 Tangy tomatoes, sweet red peppers and a touch of chilli are balanced with creamy Wensleydale and finished with fresh basil.